Are you still buying PAM, or the equivalent? In addition to being a waste of a metal can, those nonstick cooking sprays you buy in the store can have some weird ingredients: lecithin (an emulsifier usually derived from soy); a propellant such as food-grade alcohol, nitrous oxide, carbon dioxide or propane; and sometimes even silicone to help promote the formation of a nonstick film. When I used to use these cooking sprays, I remember that they often left this strange filmy substance around the perimeter of the pan that could not be cleaned off, no matter how much I scrubbed. Certain pans I owned even recommended not using cooking sprays on the pans, probably for this reason. Finally, a few years back, I discovered the Misto. 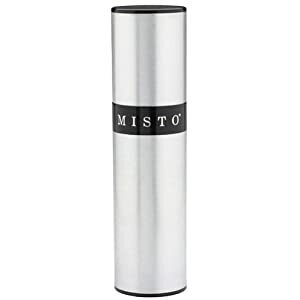 With the Misto, you just fill it up about half-way with the oil of your choice (I usually opt for the tasteless canola or olive oil), and then when you want to use it, you pump the lid to create some pressurized air, then spray. The instructions say to clean it every few weeks, but I just clean it when it runs out of oil before refilling it. (One Misto I owned eventually did jam after I went several years without ever cleaning it -- does that tell you what kind of housekeeper I am?) Since I now use only Teflon-free cooking or baking pans, a cooking spray is a must for me. For cookie sheets, pizza pans, popcorn (to make the salt stick) and other purposes, I rely on my Misto. Note that while the outside is metal (aluminum or stainless steel), the oil is stored in plastic and passes through a plastic tube and nozzle to get to your food. Non-ideal, but probably somewhat unavoidable. More choice: use whatever oil you want. Reusable instead of disposable: no can to throw in the trash. No extra strange ingredients: just oil. Will you switch from Pam to Misto? Have you already? How cool!! I have been buying the Trader Joe's versions. Totally switching to this so I can use local/organic oil and have less waste. Thanks for the idea! I love our Misto. So easy to use. My only complaint is that it occasionally leaks. Has this happened to you? Maybe I should have cleaned it more often. Hope you like it, Green Bean and Ashley! Groovy, no leaking. And I've had mine 5 to 7 years. And I don't clean it too often either (every few months?). I have several friends with them and have never heard that complaint either. Maybe you got a lemon. Great idea! I don't usually use cooking spray, so any that I buy ends up smelling rancid by the time I'm halfway through the can. I'd guess by keeping this in the refrigerator, and maybe not filling it all the way up, the olive oil will stay fresher. And I think I tend to use less oil if it's sprayed, so that's probably a good thing.